If there was a contest for Thing The Clone Wars Did That Blew Our Minds the Most, the Mortis arc would have to be the clear winner (with Maul being a respectful runner-up). I remember when I first watched the Mortis arc, I kept telling myself “this is canon” over and over again, because I would never have bought into it if it hadn’t had that G-level Canon seal of approval. What’s he going to do next, put toothpaste back into the tube? And it’s also awesome. In this edition of Reaction Corps, we fully intended to review all three episodes of the arc, but by the time we got done reviewing the first episode, Overlords, I realized we were running out of time and had to cut it short. Which means that soon we’ll be reviewing the other two episodes! You can’t have too much Mortis! Instead of doing a blow-by-blow synopsis of what we talked about on the show, I’m actually going to put something down here that we didn’t get to, but I think is interesting. 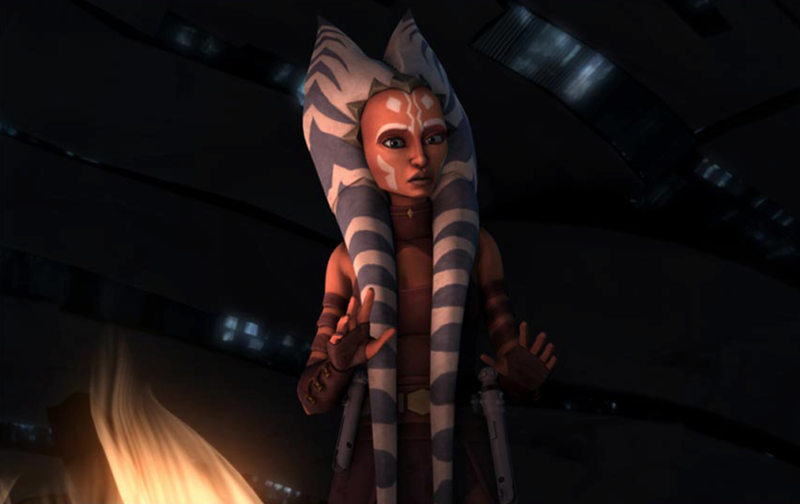 In the episode, Anna strikes upon a cool idea; that Ahsoka is actually Ahsoka from the future, and not just a vision. We get into this discussion at 26:00. It’s good stuff. I love listening to Anna come across these ideas on her own. Here’s a quick analysis of the “ghosts” we see in this episode, which I think actually lends some credence to Anna’s theory. First, we have good ol’ Qui-Gon. Like I said in the episode, Ultimate Star Wars has confirmed that this is, indeed, Qui-Gon’s spirit. Note that he is translucent. But there’s also white stuff around him. What’s up with that? Here we see Shmi Skywalker. We find out that this is actually the Son being a grade-A jerk. Note that Shmi is not translucent. In other words, when the Son (and presumably also the Daughter and Father) appear as someone they are not, they appear in a solid form. Opaque? No. You can see light through her better in other shots, but rest assured that this vision of Ahsoka is definitely translucent. Here. These other images show it plainly. You can see crystals showing through her arm and thigh. So she’s not the Son, Daughter or Father pretending to be Ahsoka. Otherwise she would be opaque. We can also deduce that she’s not the Force spirit of a dead Ahsoka, since she doesn’t have the white stuff around her like dead Qui-Gon does. Therefore, this Ahsoka is something different. It’s implied in the show that it was a dream, since we see young Ahsoka wake up after old Ahsoka disappears. But what if it’s actually Ahsoka from the future? As I say in the episode, what if she finds Mortis again and somehow projects herself back in time to warn young Ahsoka (using the same only-on-Mortis magic that allowed the Son to show Anakin his future)? 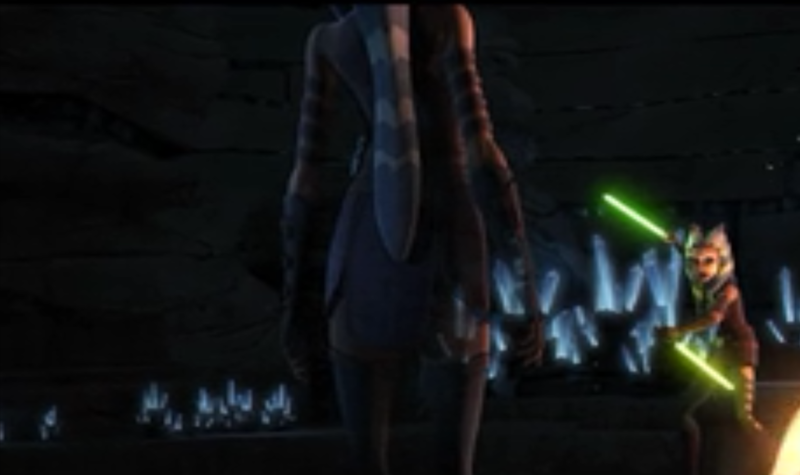 Are we going to see Ahsoka do this in Rebels? Probably not. A book? Maybe, but probably not. Personally, I have a sneaking suspicion that the word “Mortis” may never again appear in Star Wars. And while I’m OK with it not being the center of any new stories (and I’m really OK with time travel not becoming a staple of Star Wars), I think it would be a shame if it wasn’t referenced now and again. It’s a pretty big deal. It expanded the galaxy in a huge way. It may hold answers to questions we may or may not have asked yet. Or it might just confuse us more. UPDATE 11/2/15: Listening to an episode of Full of Sith today made me realize there there could be compelling motivation for Ahsoka to return to Mortis. If she sees an image of the Grand Inquisitor, she may wonder why he looks so much like the Son. She may seek out Mortis for answers. Still, probably not going to happen. But I’m adjusting the odds just a smidgen in favor of it now.